There’s an awful lot going on in Fortnite at the moment. A second mysterious bunker has appeared by Happy Hamlets, an ominous icy sphere is hovering in the sky, and the battle royale’s TV screens are now displaying a countdown, suggesting that something significant is going to go down tomorrow evening. Exactly what that ‘something’ is hasn’t been announced, but it looks as though it’ll see the return of the Fortnite zombies that first showed up in the wake of Kevin the Cube’s. The zombies, which include Ice Brutes and Ice Fiends, were datamined and posted to the FortniteLeaks subreddit yesterday. 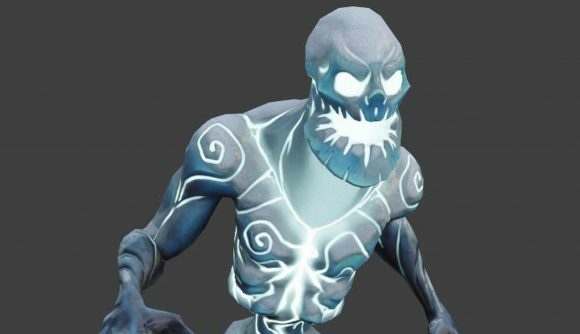 The model of the Ice Fiend which you can see above bears a striking resemblance to the monsters that first showed up during the Fortnitemares event around Hallowe’en, albeit with an icy twist. Files relating to ‘Ice Storm’ challenges have also been discovered, which reference battling a legion of those zombies, so I imagine there’ll be a few hordes you need to fight off over the next couple of weeks. The countdown is due to end at 11:00 PST (14:00 EST, 19:00 GMT) on Saturday, January 19. If previous events are anything to go by, that means there’ll be a server-wide event at that point, after which I imagine those fiends will appear. Their existence is looking like more and more of an homage to Game of Thrones. Not only does the Ice King bear some resemblance to the HBO series’ Night King, but the Ice Fiends are decent stand-ins for the rest of the White Walkers. Whether or not we’ll see a crossover when the show returns in April is anybody’s guess, but until then, check out Game of Thrones’ Castle Black built in Fortnite’s Creative mode – one fan spent hours re-watching the show to figure out the interior and exterior of the iconic Night’s Watch fortress.